And we’re back with another FAQ article this week to help you guys resolve ruling disputes! We’ve got some pretty complex situations for you today, as well as popular questions that we’ve received in our support mail, so we’re showcasing some of them here to help clear the air. Impact Monsters have been around for a few months now, and most players have gotten used to seeing them in play already! The idea of a card that is treated as both an Impact and a Monster is a completely new concept, so it’s not surprising that some are still dubious about how they work exactly. 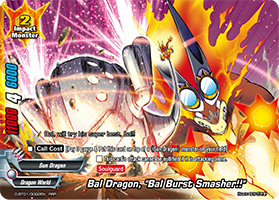 For example, if I impact call “Bal Dragon, “Bal Burst Smasher! 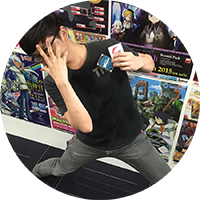 !”“, can my opponent Counter with “Begone! !” to nullify its call? Or can I nullify it with a card like “Secret Sword, Moon Fang” to nullify the casting? The answer is yes for both “Begone! 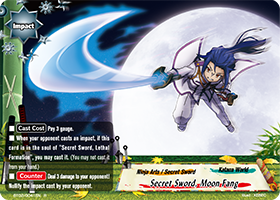 !” and “Secret Sword, Moon Fang!” Either effect would be able to nullify the call of an Impact Monster, as it is treated as the calling of a monster and the casting of an impact. 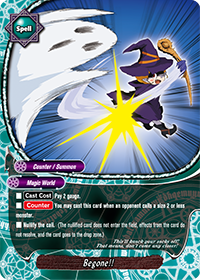 Spells and abilities that affect monsters would similarly be able to target an Impact Monster, as would spells and abilities that interact with impact cards. Casting 2 Nullify Spells/Impacts Against 1 Spell? This FAQ is a little complex, so do bear with us if it gets a bit wordy! 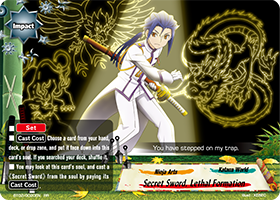 “Secret Sword Formation” is a flexible Impact card that allows you to prepare a response to any situation. But what happens when you prepared 2 “Secret Sword, Star Crushers“, and your opponent casts a spell? Well, both copies of Star Crusher will trigger and be put to stand-by. 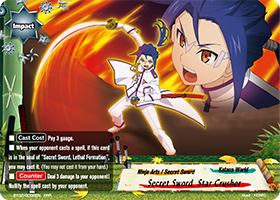 However, after the resolution of the first “Secret Sword, Star Crusher“, the trigger condition “when your opponent casts a spell” is treated as fulfilled, and subsequent copies of “Secret Sword, Star Crusher” can no longer be used. But what about the situation where the opponent destroys a monster during the main phase of his turn? When my monster is destroyed, if I am playing Katana World, I would be able to cast “Demon Way, Geppakugiri“. 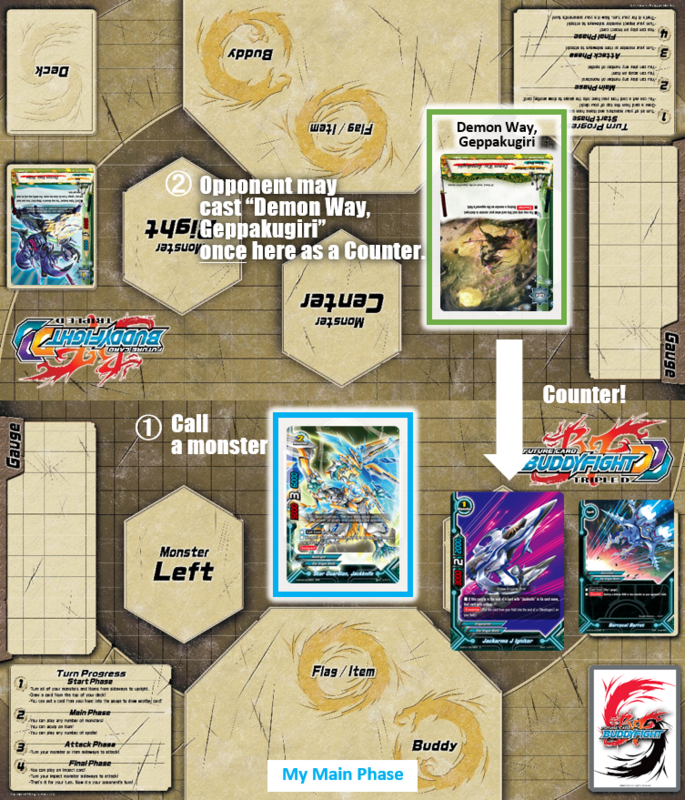 But as it isn’t my turn, I cannot initiate a play sequence with “Demon Way, Geppakugiri“, instead having to wait for my opponent to either use a card or ability, or to pass. What happens then? 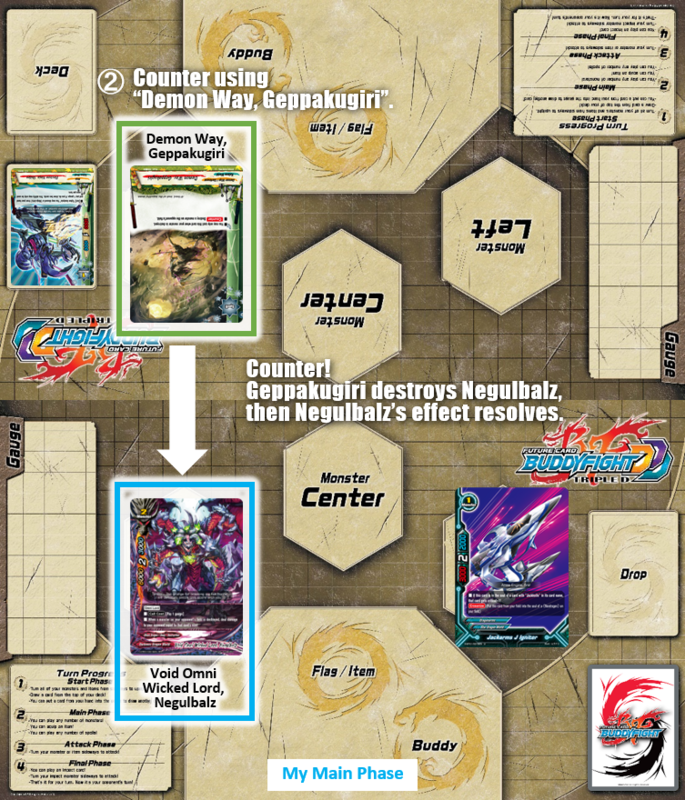 “Demon Way, Geppakugiri” can be cast as a Counter to the first instance of an action taken by your opponent that does not refer to the destruction of that monster. 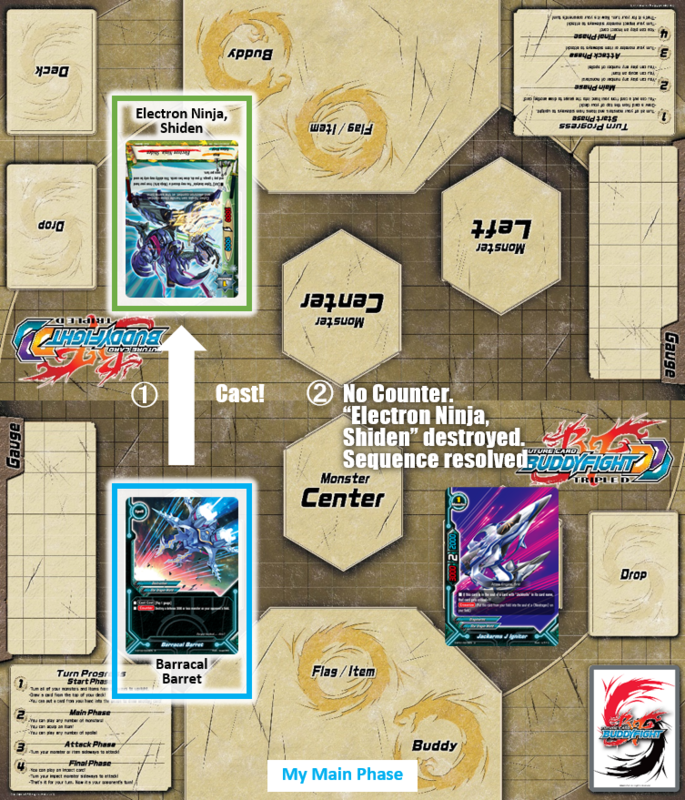 For example, as the turn player, I cast “Barracal Barret” on my opponent’s “Electron Ninja, Shiden“, and he does not play a Counter here. After this sequence resolves, during my main phase, I call “Star Guardian, Jackknife” to my field. My opponent may cast “Demon Way, Geppakugiri” here. 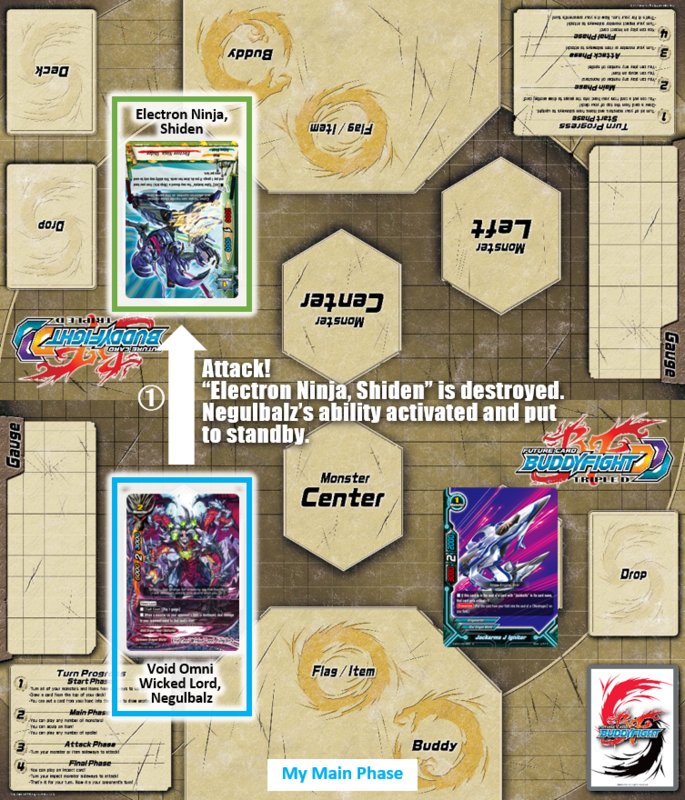 Whether or not he does so, after the call has resolved, my opponent can no longer play “Demon Way, Geppakugiri“, as a card not referencing “Electron Ninja, Shiden“‘s destruction was played. 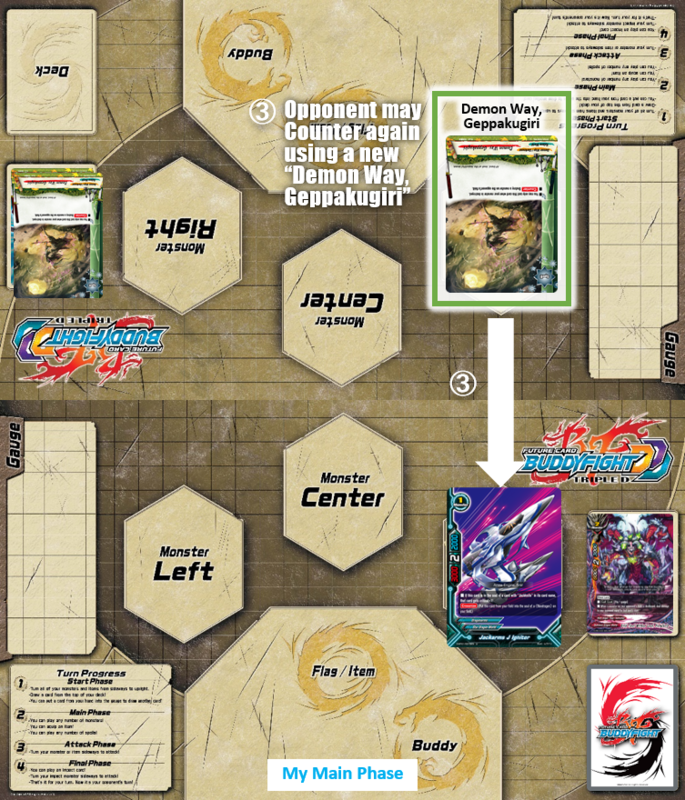 However, in the case where the destruction of the monster is referenced, the opponent can continue to cast “Demon Way, Geppakugiri“. For example, if I attack and destroy my opponent’s monster with “Void Omni Wicked Lord, Negulbalz“, “Void Omni Wicked Lord, Negulbalz“‘s ability would activate and be put to standby after. My opponent can cast “Demon Way, Geppakugiri” here. Since both effects reference the destruction of that monster, if I use another Counter here, my opponent can cast “Demon Way, Geppakugiri” again, until another card or ability that does not reference the destruction is played. “Champion Wrestler Asmodai” is a very, very powerful card. 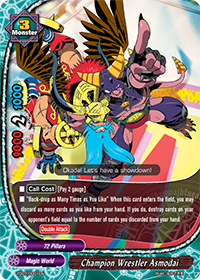 “Back-drop as Many Times as You Like” is a unique, potent and destructive ability, so it’s no wonder that there are many questions about how it would interact with other cards in a multitude of situations. 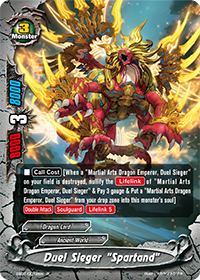 One of the questions that we’ve received a involves “Martial Arts Dragon Emperor, Duel Sieger” and its evolution forms, “Duel Sieger “Spartand”” and Duel Sieger ““Tempest Enforcer””, and how its call cost interacts with “Champion Wrestler Asmodai“. What happens when the controller of “Champion Wrestler Asmodai” discards multiple cards, and attempts to target Duel Sieger multiple times with the effect? Does the player “interrupt” the ability of “Champion Wrestler Asmodai” to evolve Duel Sieger to the next form? Can Duel Sieger’s controller evolve it all the way up to “Duel Sieger “Tempest Enforcer”” in one go, during the resolution of “Champion Wrestler Asmodai“? Well, the answer is a little bit different from what you’d expect. Basically, one portion of “Duel Sieger “Spartand”” and “Duel Sieger “Tempest Enforcer”“’s effects require the player to nullify the Lifelink of its previous form as a part of its call cost. As Lifelink resolves as though it is an automatic effect, and an automatic effect cannot resolve during the resolution of another effect, you would have to wait until “Champion Wrestler Asmodai“’s effect ends before you can attempt to call the next form of Duel Sieger to the field. 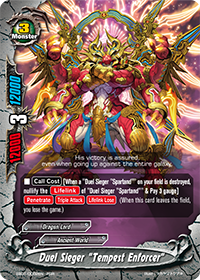 You would therefore not be able to evolve Duel Sieger to “Duel Sieger “Spartand”” during the resolution of Back-drop as Many Times as You Like (let alone fully evolve it to “Tempest Enforcer”). The controller of “Champion Wrestler Asmodai” would therefore not be able to destroy anything further than the first form of Duel Sieger. Whew! That was a pretty long article. Hopefully, everyone has a better understanding of how these cards interact now! 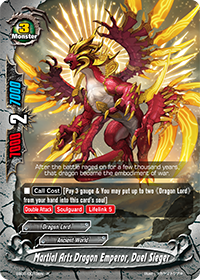 If you have any queries at all, don’t hesitate to drop us an email over at sg_support@bushiroad.com!